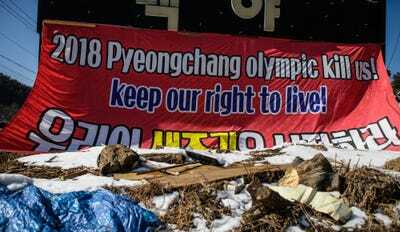 Getty ImagesLocal businesses face ‘financial ruin’ because of the 2018 Winter Olympics. 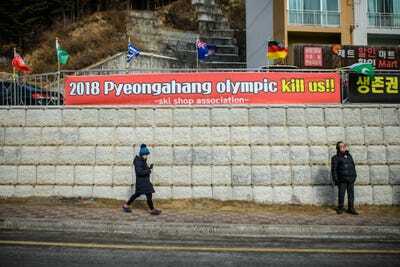 The 2018 Winter Olympics is “killing” the ski hire trade in Pyeonchang, South Korea. This is because the presence of professional athletes means slopes are closed to tourists and therefore there is less demand for equipment. 50 stores permanently have their shutters closed and business is down by 80% since last year. But not all businesses are negatively impacted. In fact, some are thriving. The presence of the 2018 Winter Olympics in Pyeongchang is “killing” some local businesses. With so many athletes competing on the slopes, there is no room for tourist skiers, which has caused a number of ski shop owners to be “left out in the cold,” according to a report in The Guardian. The Phoenix Ski/Snowboard Rental Shop Association in South Korea claims business is down by 80%. Approximately 50 shops have stayed shut and the ones that have remained open are suffering a decline in footfall from previous seasons. Jong, the head of the Phoenix Rental Shop Association, met with government officials to request a $US30,000 (£21,000) compensation for each store. This fee would act as a subsidy of sorts, as Pyeonchang hire shops receive the bulk of their year-long trade during a five-month window during skiing and snowboarding season. So are all businesses in Pyeongchang suffering? Not at all. In fact, businesses in the hospitality industry are thriving. Not far from where the ski hire protests are taking place is a hotel that is at operating at full capacity, and other hotels raised their prices in time for the 2018 Winter Olympics. The restaurant trade is also booming.